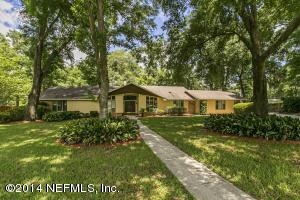 Description: Lovely & spacious 4/3 Ranch in the beautiful gated community of Loch Rane - a quiet and secure neighborhood bordering Orange Park County Club. This traditional 2425 sq ft home offers a double entry Foyer, Formal Dining Room with built-in cabinetry, large Eat-in Kitchen, Great Room w/ vaulted ceilings, massive floor to ceiling windows, gas Fireplace & French doors leading to a sizable screened porch overlooking the enormous and very private backyard. Roomy Bedrooms and a Master Suite w/ a huge walk-in closet, double sinks, oversized Garden Tub and Walk-In Shower. Plus, w/a membership, you can enjoy the amenities of the private Orange Park Country Club offering Golf, Tennis, Pool & a Club House! What a deal! What a house! What are you waiting for! !